20x25x4 Four Seasons Annual Pleated AC / Furnace Filter (MERV 8) | Air Filters, Inc. Easily Converts standard air return ductwork from 1-Inch standard filters to this new and innovative 4" design. All without any modification to your home or furnace system. 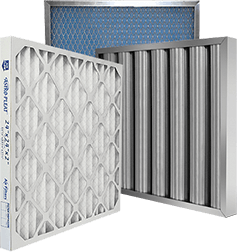 Simply remove your existing filter and replace it with theFour Seasons™ MERV 8 Annual (Up to 12 Months) Expanded Metal Backing pleated Air Filter no tools or modifications is necessary. Utilizing electrostatically charged, 100% synthetic media which our filters offers significantly higher particulate efficiency than regular poly/cotton media pleated filters, with little change in static pressure. MERV 8 filter media will not promote the growth of bacteria, mold, mildew, or fungi in normal operating environments, and has not been chemically treated. Four Seasons™ MERV 8 pleated filters are an ideal upgrade from standard disposable panel filters. These filters are designed to last up to 12 Months. 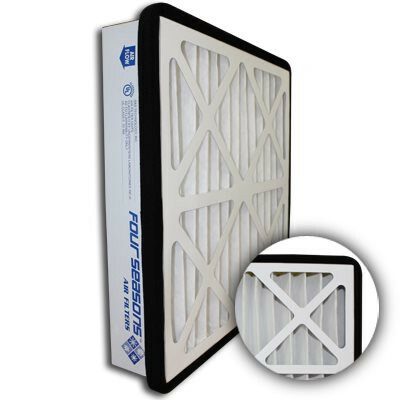 Air Filters, Inc.™ Four Seasons™ MERV 8 Annual 4-Inch pleated air filters effectively reduce/remove pollen, dust, pet dander and dust mites for circulated indoor air. Filtering these airborne particles can help alleviate allergies and sinus irritation that can cause watery eyes, itchy throat, coughing, and sneezing. Additional benefits are extending the life of your Air Conditioning / Furnace system by allowing the system to work more efficiently and economically. The tapered shape allows the 4" depth to extend into the ductwork to allow for more extraction of airborne contaminants. The rim gasket holds the filter in place and forms a tight seal to maximize filtration. The Four Seasons™ Air Filter quickly and easily "converts" your return air from the use of a 1" filter to this new and innovative 4" design. Air Filters, Inc.™ Four Seasons™ MERV 8 Annual 4-Inch pleated air filters use the optimum blend of synthetic fibers to insure high dust holding capacity and filtering efficiency. * MERV 8 annual pleated air filters media is thermally glued to expanded metal backing to prevent the media from sagging during the filter's use. * MERV 8 annual pleated air filters pleats are formed in a radial configuration to insure proper dust loading. * MERV 8 annual pleated air filters cartridge is encapsulated in a heavy duty die cut beverage board frame to insure filter integrity in high moisture applications. * MERV 8 annual pleated air filters face of the die cut is internally glued to the apexes of the pleats to insure maximum endurance under adverse conditions. * MERV 8 annual pleated air filters media is electrostatically charged. * MERV 8 annual pleated air filters contain 9 pleats per linear foot which creates a greater surface area to catch airborne particles.